One would assume it would be easy, in 2018, to simply pay a utility bill online. One would be incorrect. At least in Mexico. CFE (Federal Electricity Commission) is our electric company here in Mexico. Our electric bills are delivered every 2 months here, so over the last 10 months, we’ve paid our bill 5 times. It seems like every time we pay it, it’s with a different method. When we first arrived here in Mexico, we simply gave cash to our landlady, and she paid the electric bill. Likely by going to the local convenience store – OXXO. 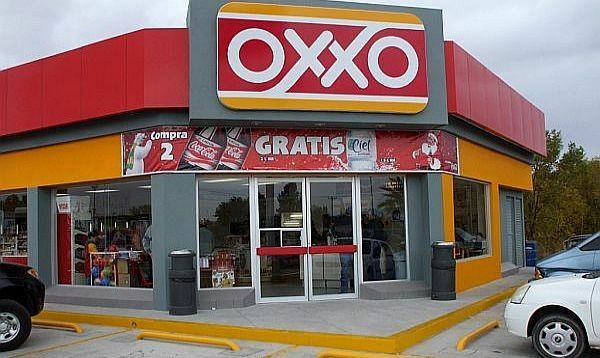 OXXO’s are a chain of convenience stores all across Mexico. It seems like you can do almost anything at OXXO- buy beer, pay your utility bills, re-charge your debit card, add minutes to your cell phone, etc. Shortly after we moved, I was able to create an account at the CFE site, and I was able to access my bill. It’s actually a decent enough website, and provides historical data, access to your bills, etc. In addition, I could pay my bill online with a credit card. w00t! ’cause I’m all about earning those credit card points! It was actually super easy to pay online at the CFE website, and I was able to use one of my US credit cards. Fast forward two months, and I again try to pay my bill online at the CFE site, but my credit card is rejected. Ouch. I tried with multiple credit cards, MasterCard and Visa – all the same. The word ’round the campfire was that CFE had stopped accepting US-based credit cards. doh! Time for a new plan. A friend told me I could pay my CFE bill with Xoom. Xoom is actually owned by PayPal, and their primary purpose seems to be making it easy to transfer money to people in other countries, either into a bank account or at a cash pickup location. 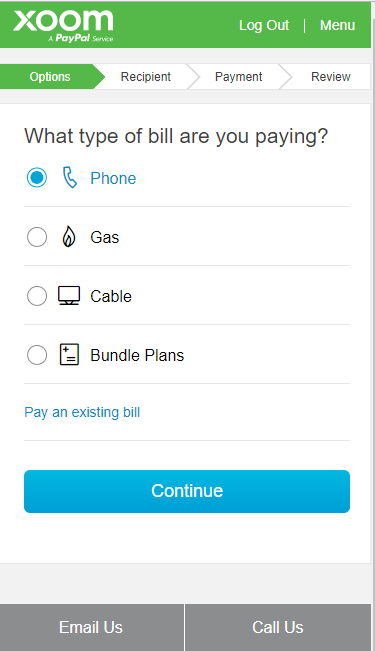 In addition, they allow for online bill pay – such as paying your phone bill, gas bill, cable bill, and electric bill. So for the last few months, I’ve been successfully using Xoom to pay my CFE bill. Their service charge is $2.99 USD. For me, it’s worth it to pay my bill online with a credit card. It’s convenient, plus I’m all about earning credit card points. A week ago, I tried to again pay my CFE bill using Xoom, but it seems that they no longer accepted CFE payments. As you may have learned, we are experiencing a service interruption with transfers going to CFE (Comisión Federal de Electricidad). We are working with our partner to resolve this issue as soon as possible. We apologize for the inconvenience and will inform you as soon as the service is available again. Time to change tactics again. Someone on one of our local facebook groups said he had been using the Switch app to pay his CFE bill since last year, but as of this month they also no longer allow bill pay to CFE. I’m guessing that CFE changed something on their end (from a technical standpoint), and that’s affecting the integrations with Switch and Xoom. Another friend (Kim at Run Away Realty here in Puerto Morelos) suggested using the pagamobil app. I downloaded the app and signed up. From the home page, click on the Formas de Page icon at the bottom of the app. Click on the + Agregar metodo de Pago to add either a credit card or enter your PayPal account info. I used a credit card. Click on the Verificar Cuenta icon. Verificar Identification (verify your ID). I uploaded a copy of my Mexican driver’s license. Now that all your information is entered, you can pay a bill. 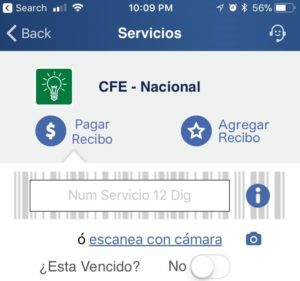 Click on escanea con camera, and take a picture of the barcode on the bottom your CFE bill (which you can get from CFE website). I tried entering the 12 digit service number manually, but that didn’t work. Select your form of payment, and submit. My bill pay seemed to be successful, but it went to an In Process status. I had to wait a couple of days for pagamobil to verify my information and ID. After 2 days, my bill pay showed as Pago Realizado (payment made). I logged into the CFE website, but my bill didn’t show as paid. So, I was finally able to once again pay my CFE bill online. This time it was using the pagamobil app, on my US-based iPhone, using a US-based credit card. In 2 months, when my next electric bill arrives – we’ll see what happens. I’ll try again to pay directly on the CFE website, but I don’t have high hopes that they’ll accept my US-based credit card. Hopefully the pagamobil app will still work! Successfully paid using the pagamobil mobile app using a US credit card – it worked perfect! CFE is now allowing online payments with American Express! Tried paying online on the CFE website using a US -based Visa and a US-based Mastercard – didn’t work. 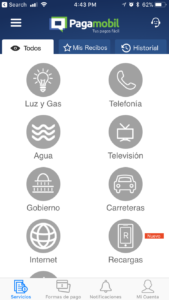 We are happy to report that our Bill Pay service CFE (Comisión Federal de Electricidad) to Mexico is available again. Sweet! Another option for paying CFE bill online! Do you know of any sits one can pay their CFE bill without large commissions? Paying directly at http://www.cfe.gob.mx/ would be your best bet. Does not work with US cards. Gerry – sorry, can you be more specific? *What* doesn’t work with US cards? I know that the CFE website and CFE app don’t work with US cards – but the Pagamobil app does. I tried today to use my local-bank ATM card, it’s visa. The CFE site rejected it just as it did my two US based cards. I tried Pagamobil and it worked like a charm. Many thanks for posting this information. You saved me loads of headaches. I have a mac book pro and I couldn’t get the pagamobile app to download. Any ideas? Jackie – not sure. I downloaded it on my iPhone from the app store without any issues. This information was VERY helpful thank you very much. I had precisely the same experience with the denied American cards from cfe.mx, then Xoom being disabled. I’ve been scouring the internet for a solution for hours now. After calling all over, (including a management company that wanted to charge me $25 a month for paying the one bill) this post about Pagamobil saved me from going down to a house with no electricity. Thank you! This was great! Please post more if Pagamobil ever dies on us! Glad it was helpful! We’ll definitely post an update if there are any changes. I paid my bill at the cfe office here in mazatlan.I used a Canadian mastercard and the process was very confusing as no where did it acknowledge that it had processed the payment. Unfortunately I did the process 4 times so I now have a three month credit on the bill. The exchange rate was also poor .It was about 3% less than I got at other stores on the same day.I am assuming that is what they charge. Thanks for sharing the info Frank! Just an update on my overpayment with mastercard at the cfe account. I called mastercard and explained my storey of over payment. They were quite helpful and had them all reversed within a day. Not the usual experience I was expecting. A little 101 here, if I may. You can indeed pay at CFE office if (IF) there is one nearby. Not my case. You can either pay to the teller or at the CFE pay-station outside. You don’t have to pay by US credit card and incur poor exchange rate AND 1-2% surcharge by US credit card for the foreign transaction, because both teller and pay station will gladly take pesos. Alex – good points. But, I think the issue many of us are trying to solve is that we *want* to pay it online. Either for convenience, or because many are out of the country for a period of time, and still need to pay the bill. For example, many snowbirds are not in Mexico during the summer, but still need to pay their electric bill. Exchange rates and foreign transaction fees are easily resolved by having a good credit card. Most good credit cards don’t charge a foreign transaction fee. And many people will gladly pay a small fee to be able to pay online. If you are in Mexico, the best way is take cash to the CFE office and use the kiosk. Best exchange rate is usually at a bank ATM. Most charge a modest fee, so we get the maximum amount any time we get cash. Then the percentage is smallest. When we leave Mexico, we try to put more than enough to hold over until we get back. We missed a trip, so I am going to try Pagamobil when we run out of credits. Thanks Mike! Yes, paying at CFE office is easy, but it’s even easier if I can pay it without leaving my house! 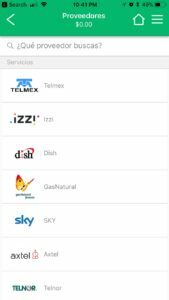 Do you need a Mexican ID for the app’s ID verification process? What other forms of ID can be used? It doesn’t explicitly state that it has to be a Mexican ID. My hunch would be that any passport would be OK. If you should find out for sure – let us know! I got my PagaMobil account with a GOOD photo (taken by my Samsung Galaxy Note 4) of my US Passport. Driver License from Oregon was NOT accepted by PagaMobil. I’m so happy I found this post! I had been using SimplePay until they went out of business, and after CFE stopped accepting US credit cards, and Xoom and Switch stopped working, I’d been wondering if I’d have any other options for paying this bill online. Yes – it looks like you can still pay at Oxxo (as well as 7-Eleven, Chedraui, and a bunch of other places). May I use my Citibanomex debit card to pay CFE at the local Oxxo, or do i need to bring cash? Randolph – I’m not sure. I’ve never paid at Oxxo, as I prefer to do it online. Maybe someone else here has an answer for you. If you do find out – please report back! Thanks! I tried to pay several times with a Credit Card at OXXO in Playa del Carmen. They say they only take cash. That link says I can pay at 7-Eleven and Walmart, which there are plenty of where I spend time in the US. But DO THEY WORK FROM THE US STORES, or only the Mexico stores? Thanks! I doubt that you can pay your Mexico utility bills from a store in the US. Thanks, I rather doubted that possibility, too. The thing that works best for me is Pagamobil, which allows for paying any utility bill or phone bill in Mexico, and anything under 500 pesos is only a 12 peso charge. You must have a Mexico cell phone to use it, though. I pay 150 pesos a month for that excellent service. Problem solved. I use the pagamobil app on my US phone, and it works perfectly. Just tried the same thing with Pagamobil, they wanted 550 pesos commission. It was a high bill, but that is a little excessive. I will pay at OXXO this time and try again for the next bill. I received my bill last week and there is no deadline date printed on the bill. On my prior there was a deadline date for payment printed. It appears that CFE has changed the format of their bills? They did change the format, but I still see a due date. I see a “limite de pago” at the top right hand side of my bill which shows the due date. 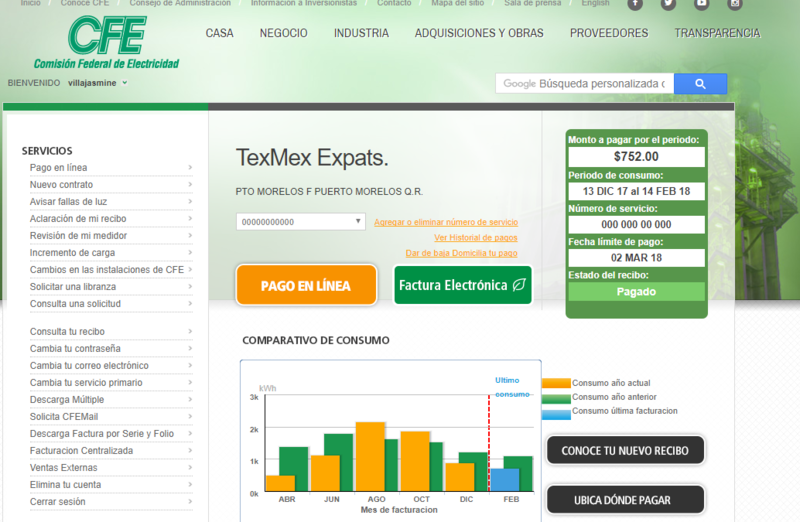 And if I login to cfe.mx and look at their site, there’s a “Fecha límite de pago” which shows the due date. 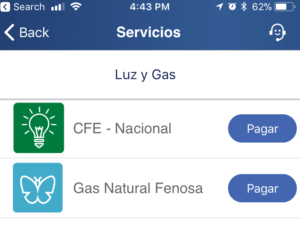 NEW IPHONE APP called “CFE Contigo”, go out to your apps and search, add the APP and you will be able to scan in your bill. I haven’t actually paid a bill yet so I can’t say if they will accept an American VISA, but they definitely have the button there to make a payment. try it. Cool! Hopefully they take a US credit card (although I’m overly optimistic). It’s worth a try though! Thanks for sharing! Were you able to use your USA credit card with the CFE Contigo app? Sandi – thanks for the comment! Were you using a US based credit card(s)? a Mexican credit card? other? Hi thanks so much for info! I have gone through exact same problems! So frustrating! Praying all goes thru.. they did chg 100 pesos but it’s worth it to not have to take cash out and exchange for pesos and pay at kiosk. Will update if my payment actually goes thru.. fingers crossed! Thanks again for the info and help much appreciated! Good data point about the cfe app – bummer that it didn’t work. I suspect that pagamobil will contact you soon to go through verification. Please do let us know how things turn out! I have received my CFE bill via email, tried repeatedly to pay on the CFE website. I seem to find myself in an endless loop, unable to make a payment. I tried the CFE Contigo app with 4 different credit cards, each one rejected. Short of driving to Juarez, I’m not sure how to get this bill paid. Any other ideas???? Debra – did you try using the pagamobil app? * Successfully paid using the pagamobil mobile app using a US credit card – it worked perfect! Thanks so much for this info. I too went thru the same frustrations the past few years and yeah Pagamobil has now worked perfectly three billing cycles. Very easy, although the site is in Spanish, it is very easy to translate and understand the process. Super – glad that’s worked for you as well! Gary, I cant figure out the camera. It only says cancelar and no place to take the photo. Any ideas? Hi Dan – sorry, not following here. Are you having trouble using one of the mobile apps that were mentioned? I have been using the saldo.mx phone app for the last few months to pay from the US and it has been working. Up till now their fees have not been excessive. You have to pay them a certain sum of money so they can make the payment for you to CFE from that sum of money. Interesting – a new option! Raul – do you know what the fee that saldo charges to pay a bill (such as a CFE bill)? FYI, for others who may see this – I downloaded the app, and tried to register. It wouldn’t properly register me, simply telling me that my information was wrong. I then VPN-ed into the US, and the registration works. So at least for me, it seems that you have to be in the US (or VPN-ed into the US) in order to register. You can now pay CFE plus other major Mexican billers on the Western Union app and at Westernunion.com. I’ve already used it once to pay from the U.S. It’s convenient in the sense that you only need to enter your CFE account number and the app/website will return the exact amount due on the current invoice. You can pay with your credit card, debit card or even a link to your U.S. bank account. The fee is $2.99. Nelson – that’s great! Thanks for sharing that information – that seems like a solid option! Any luck with Western Union? I have tried CFE and it keeps giving error codes. talked to customer service and they said it’s just my phone/computer/internet. I tried 3 different phones and 2 computers, so I don’t believe it. Do you know how long for CFE to recieve payment after i make my payment through western union? Related – here’s a great blog post that someone else wrote that goes into detail about the CFE bill itself. Good stuff! Can you pay your CFE bill in advance an estimate of what you think it might be for several months? Good question! But I don’t know the answer. I have heard of people doing this with their water bill (likely because those are pretty low), but I haven’t heard of people doingit with a CFE bill. Hopefully someone else will comment on this. You CAN pay in advance on the cfe bill. Have been doing it for a couple of years(as have others)At the office with the customer rep. or at the autoteller, scan your bill and put in whatever you think is needed. On the quarterly bill there is a running tally to let you know your balance and of course it just keeps paying until gone. Of course this is on the west coast, pero quién sabe? Thanks for the tip Tim – that’s good to know you can pre-pay. Hallehlujah! Finally, a way to pay my CFE bill like a normal 21st-Century person! ONLINE! WITH MY US CARD! Thank you all so much for the Western Union option. The service charge is a pittance compared to the time, energy, and expense that I usually have to spend. It’s even a hassle to pay when I am in Mexico. Signed up (about 5 minutes) and it worked like a charm. Thanks for the tip…..
We have a bank account here in Mexico with HSBC and have the CFE bill direct debit our HSBC account every billing cycle. No more last minute rush to Oxxo. I get a notification from my bank of the payment. To set up a Mexican bank account with HSBC all you need is: 1) funds to open the account [$3,000MXN is sufficient], 2) your Perm. Res. card, 3) passport, 4) water or electric bill in your name that shows your domicile. That sounds good, and I would have gone that route except I did not want to wait in line at the only bank in town or try to talk to someone in there. I was able to do everything on PagaMobil through text and Email with Google Translate. Thanks for the great info, I am just starting out with CFE having bought a home in Ensenada BC. I am rampant to use credit cards where I can (one pays out 5% rewards for some stuff). I hear many US rewards cards are not going to be accepted even in the States as soon as a lawsuit is completed. I use my Chase Bank INK card at Walmart here and get 18.7 pesos per dollar exchange rates when the current rate is 18.75 pesos per dollar. That said, the absolute best way to get cash at an ATM here is with a Schwab Bank Visa Debit card. The exchange rate is dang good, but the best part is Schwab pays transaction fees 100% WORLDWIDE. I have used it in Central America and it just always works and they always repay my transaction fees. I don’t leave home without that card and can restock it online as often as needed. You can also make wire transfers internationally for $30 a pop, where most all banks in the US won’t let me do wire transfers at all. Keep the good info coming. My plan so far is to have my neighbor pay my CFE for me while I am out of the country. I just paid my TelNor Internet/Phone bill online with my Chase Bank INK Credit Card (thereby pocketing a nifty 5% reward! ), directly on the TelNor website. Worked like a charm and gave me 18.970272 pesos per dollar. The bill was 619 Pesos and .05 seconds after I paid I got a text saying they charged my account $32.63. Today’s exchange rate shows 18.96 pesos per dollar on Google, so I made out better than OK! The INK card for Chase is a business credit card that I have kept for the great rewards, although I retired Nov 1, 2015. I can see why CFE might not want to be involved with Visa’s rewards, or even US credit cards at all, but why not at least give us a free Visa Debit Card option??? For those of us who have up to 5% rewards, the issuing banks pay that portion to keep us using the cards rampantly. By the way, I am NOT a high-income household, I just always like getting rewards and not being responsible for fraud or theft, so I ALWAYS USE CREDIT CARDS when I can, ALWAYS PAY THEM OFF every month, and stoop to debit card use only when I have to. Cash is LAST on my list, especially when I have to thrash my car and my brain to go into town to pay a stupid bill in person. DO not try BillMo for making payments in Mexico unless you have a Mexican cell phone. I set up a complete account with my US cell phone number and then tried to figure out how to make a Mexican utility payment. Can’t do it unless you set up a BillMo Pago account which REQUIRES a Mexican cell phone number. I wish there were no borders in the world, physical or otherwise. That sounds so very Mexico! Thank you for this, very helpful after months of going around in circles on the CFE Website trying to make online payments and failing. I have a small issue in that I am no longer receiving paper bills and I can’t see the bills online in order to know how much to pay (just going around in circles again). Has anyone else experienced this and how can I find the bills online. Secondly, the bill is in my landlord’s name, how would I transfer it to mine? Transferring the account from your landlords name into yours is a bit more complex. I would say keep it in your landlords name, unless you really need it in yours for some reason. Ours is still in our landlords name – but we have online access to the account – that’s the important thing. I would check with your landlord to see if it’s OK that you get online access. If your landlord is cool with it, and you have a copy of a recent bill, it’s pretty easy to get online access. Create a new online account on the cfe website. Then, click on Add or remove service number (Agregar o eliminar número de servicio) – then follow along, entering information from a past bill – then you should be able to access the account. I did this last year, and I remember it being pretty easy. If your Spanish isn’t great – use the Google Chrome browser – it will automatically translate the web page into English. Hope this helps – and good luck! I went to the CFE office in Ensenada today to change my billing information from the previous owner to me. There was a 387 peso bill remaining (which I just received a paper copy of) and I couldn’t tell whether that stopped her from changing the name on the account, so I offered to pay it first on the old name at the CFE-Matic ATM, but she said that wouldn’t do it. Might have to return again in two months. I set up a PagaMobil account from Google Play Store and paid my bill online today instantly with my phone, for 12 pesos. Apparently I could pay any CFE bill that I had the account number for! It went through within an hour or two, although I expect it to take longer to verify through CFE. I used a US Chase Bank credit card (one of the ones that has $0FX fees) to fund the account, and in checking my account I see that I got an exchange rate of 19.22 pesos per dollar, when today’s rate shows on Google at 19.28. Not bad, and worth the 63 cents US to not have to leave the house! My Chase INK card has a 3% FX fee. My regular Chase Amazon card has no FX fee. Go figure. The PagaMobile account was tough to set up because they send you a certain amount of pesos deposit into your account and you have to tell them what it was… but it gets translated into dollars at Chase, and who knows what exchange rate they used? All I know is it didn’t work, so I had to deal with the EXCELLENT customer service at PagaMobil to finalize my account. Now that it’s done I can pay any Mexican bill for very little fee with my US credit card. You’re Welcome! Note that this next bill I got WAS in my name, so whatever we did worked, it just took a cycle. I was a bit surprised to see a 555 peso “deposit” and a 59 peso “DAP” on the bill, with very little electricity use, but just paid it and figured it would come out in the wash later. Thanks for all the great info Gary et al. • Western Union – I used this option for CFE for the first time today and it seems to go through just fine. -Western Union offers a better exchange rate. -Western Union happily uses my credit card with no extra fee or hassle. This is a great article – thank you for sharing. One question. I see the picture you posted of your CFE dashboard but I can’t for the life of me find that view anywhere on their website. I see how to pay but I don’t see a total of what to pay anywhere. Is that info on their site or are they expecting you to just get the mail and know how much you owe? CFE has made some changes to their website, so it looks different than it did earlier this year. As soon as you log in, the Account Status page shows the current amount to be paid. Also, on the account status page, on the lower right side is a list of account statements, where you can access each statement in PDF format, which is the same format as what they send to you via mail. Note that if you use Google Chrome for a browser you can have it automatically translate any Spanish page without touching a thing. It does the CFE page reasonably well and sure takes a lot of the confusion out of things. Wish FireFox had that! Thank you for this post! I paid my first CFE bill last night using Pagamobil. I am happy to find this blog. I spent half a day trying to pay with a US Visa Card. I tried to set up Pagamobile account and had to verify the deposit in my US account. Of course my deposit in USD and they are looking for the PS amount they sent so this was impossible. I went back and tried an US AMEX on the CFE site and it worked with no additional fee and the exchange rate was market rate!! Awesome Mark! Glad to hear that worked for you! Hi Gary. I use XOOM extensively to transfer money to my caretaker in Los Cabos. I have always just sent him the money to pay the CFE bill. When I saw that XOOM offered the bill-pay link to CFE I thought I’d try it to pay my Feb-March bill. BUT when I entered my 12-digit number I got a notice that there was no balance due. I called “customer service and after explaining my situation, I started getting a lame excuse telling me that they could not pay “overdue” bills. This confused me and I explained that my bill was NOT overdue (pay by April 7). It finally became apparent that XOOM considers any bill more than ONE month old, overdue and not only can they not pay it, but it shows up on the site as “no balance due”. I tried to explain to him that CFE bills every 2 months, but he kept repeating the policy like a broken record not even able to acknowledge my situation. He finally transferred me to a “supervisor” who said the same thing and when I challenged him by expressing my disappointment that a Silicon-based, PayPal affiliated company could not seem to adjust to this 2-month billing situation he could offer no help and even went on to say that “several of our customers pay their CFE bills monthly sir” as if I was some sort of exception. Gerald – interesting. Thanks for sharing that information. That does seem like an odd policy – even if the bill is late, so what? Why wouldn’t I still be able to pay it? It doesn’t surprise me though that they have some baked-in rule that considers any bill over 30 days to be “overdue” – that’s a very US-only focused rule. I work in high tech, so don’t be enamored with a company just because they’re based in Silicon Valley – there’s plenty of non-critical thinking and design decisions that happen there. But, it’s good to know that if using Xoom to pay CFE, you might need to do it within 30 days of the billing date. Make that Silicon Valle based company. Sorry: Make that a Silicon Valley based company. so i signed up with Pagamobil however to verify my CC im having problems. its posted in USD (like .16 USD) and every time i try to post the verification it says not correct amount. then i convert it to MX and still not accepted. maybe PAgamobil uses a differnt currency converter than me? any help in these regards?? Hmmm – sorry Alex, I don’t remember having any issues like that when I signed up. Maybe try contacting Pagamobil customer support? CFE turned off electricity on Wed. No bill received by us. Paid it on Wed. Was told to pay at their credit card machine. Got a receipt. Power not turned on Wed. Went back on Thurs. Was told it would be turned on at 3p. No power. Went back on Fri. Told the same thing. No power on Fri, Sat, Sun. Going back today (Mon.) What to do? Other than continuing to contact CFE, I really don’t have any other suggestions for you Linda. Sorry. Hopefully things have been resolved and your power is back on. New to the game here in Rosarito Beach…signed up for an online account and asked that bills be sent to my email address. So far have not received a bill either online or on paper although it’s time for one. Is there a magic word? I get into my account, but (and I’ll admit my Spanish is not the best yet)can’t find the right line to click to see my current balance like I do with IZZI for internet service. Any help much appreciated – and gracias, mi amigos and amigas! Hi Molly – sometimes we still get a CFE paper bill, sometimes we don’t. Sometimes I get an email telling me we have a new bill, sometimes I don’t. Instead, of relying on CFE to notify me, I take matters into my own hands. I simply set a calendar reminder for the 15th of every other month, and I log into the CFE website to access and pay my bill. Also, if you use the Google Chrome web browser, it will translate the website into English for you, which makes it super easy to use the CFE web site. Thanks much, Gary. We smiled at the response and will follow your lead to just check at the time we should be getting the bill. We’re in a condo where the bills are left with the security guard. Have had water and power both turned off at different times during our four months here because of mix-ups with the bills. As you said, very Mexico. A small thing in the bigger, delightful picture.